Until everyone is absolutely clear on precisely what Instagram will or won’t be doing with users’ images come January 19, it looks as if the photo-sharing company will have to endure a rocky ride. National Geographic stepped into the controversy on Tuesday when it announced it would consider closing its account if Instagram failed to change its new terms of service. “We are very concerned about the direction of the proposed new terms of service,” the magazine said, adding, “If they remain as presented, we may close our account.” The stark message was presented on an image posted on its @NatGeo Instagram feed. 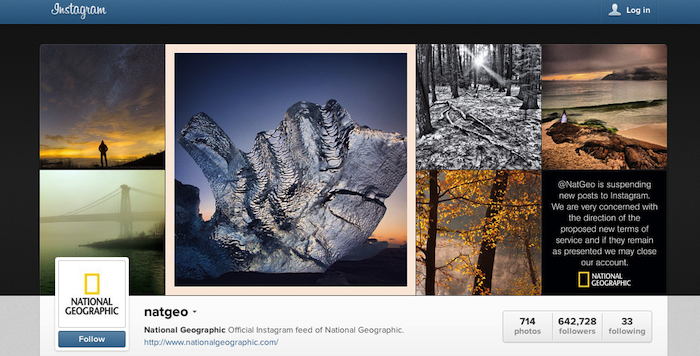 National Geographic certainly operates one of the more prominent feeds on the photo-based social networking site, with more than 640,000 followers enjoying its broad range of striking images posted by its army of photographers located around the world. Instagram stepped into a large tub of hot water on Monday when the Facebook-owned firm announced it would be changing its terms of service in January. The new terms appeared to suggest the company would be able to sell users’ images to third parties without notification and without having to pay them a single cent. Not surprisingly, it didn’t take long for Instagram users to kick up a stink, forcing company CEO Kevin Systrom to take to his blog in a desperate attempt to prevent the damaging situation from spiraling out of control – a situation which could ultimately see masses of disgruntled users desert the site if the change to the terms isn’t absolutely clear about how Instagram will use images posted on its site. He added that there were no plans to turn users’ images into advertisements as the terms appear to suggest, and promised to “remove the language” causing the confusion over how the company intends to deal with images on its site. 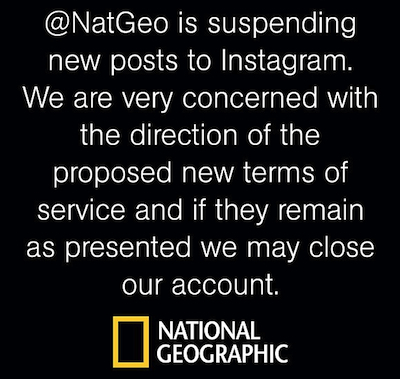 National Geographic’s statement was posted after Systrom’s blog post, evidence that the magazine, and many Instagram users like it, will want to see the re-worded terms before deciding how to proceed.